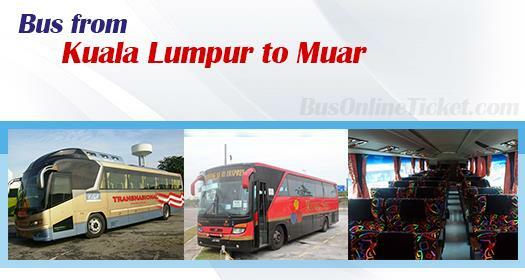 Bus is the only available transportation to travel from KL to Muar option because flight and train service network do not cover Muar. Muar is a city producing Malaysia best Otak. Mayang Sari and Transnasional are the only two reputable operators serving bus from KL to Muar. Transnasional is Malaysia largest bus company backed by government, hence their service is always reliable. Mayang Sari is one of the Malaysia top-managed bus company with emphasis on quality service and punctuality. Besides that, Mayang Sari hourly schedule from morning 7:00 to evening 23:30 offers great travel flexibility to passengers. Duration required for bus from KL to Muar takes about 2.5 to 3 hours depending on traffic condition. All express coaches in Malaysia have no toilet on board, but passengers could request for stopover along the highway from driver for toilet break. Bus from KL to Muar costs RM 17.60 per ticket. Bus is departing from Kuala Lumpur TBS (Terminal Bersepadu Selatan) to Muar. TBS is the recent built bus station to replace Pudu Raya which was closed in November 2015. TBS is at Bandar Tasik Selatan, just south of Kuala Lumpur central. Travellers could reach TBS by taking LRT and get down at Bandar Tasik Selatan Station. The coach will eventually terminate at Muar bus station. Because of limited operator serving bus from KL to Muar, commuters are advised to book online in advance with BusOnlineTicket.com to avoid delaying your journey waiting for next hour bus schedule. The booking process is user-friendly and payment is secured.